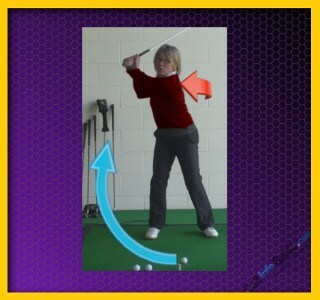 Golf Backswing: How Much Should A Women Golfer Take The Club Back? 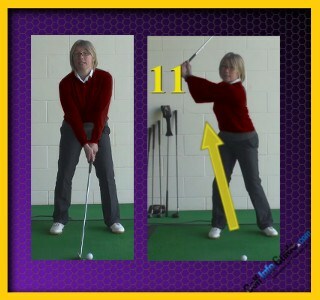 The backswing of a golf swing is used to generate power and to accelerate the club towards the ball in the downswing. Therefore, the backswing needs to be of sufficient length to provide a long enough time for the club to accelerate to the maximum velocity before the impact area. It is often perceived that the longer the backswing, the more chance the club has to accelerate before the impact, which results in more club head speed and longer golf shots. However, it must be considered that golfers of different sizes, ages, flexibility and experience should not all swing the club to exactly the same position. There should be a balance between generating power and generating control. Ideally the club should be swung between the 2 o'clock and 3 o'clock position where 3 o'clock would be pointing towards the target line or flag. However, if you feel that you are restricted due to age, flexibility or injury, it is perfectly acceptable to feel your swing to be shorter than the prescribed 2 or 3 o'clock position. A good drill to help you feel the correct length for your backswing would be to set up facing a mirror or reflective window. Then you start to turn into your backswing. Watch in the mirror to see how far back the club travels. Notice how you should try to turn your shoulders to 90°, keeping your left arm straight and your wrists cocked to around the 90° position. Try to feel that you minimise the movement of your hips and your legs as this increases inconsistency and can reduce the powerful turn that you're trying to make. Notice how far back your swing has gone. If you feel that by really forcing your turn you can make a bigger swing, it should actually be avoided as forcing your body to turn beyond its natural limit will increase inconsistency. At the top of your swing, you should really feel that you have only used 90% of your total flexibility. This will result in a swing that is well within your comfort zone and something that you're able to repeat on a consistent basis.